Anthony Joshua faces Alexander Povetkin on Saturday in front of a 90,000 crowd at Wembley. We’ve taken a look at the markets and the Anthony Joshua method of victory odds have the British heavyweight champion projected to defeat Povetkin by knock-out at 4/11. Trading at 4/11, the bookies reckon the Watford warrior’s most likely course of victory will be through a knock-out – a technical knock-out or disqualification. Despite the Russian having tasted defeat in his boxing career only once, William Hill’s traders have Joshua as a 1/8 favourite in the bout betting with Povetkin’s odds trading at a monstrous 7/1 pick. The ‘White Lion’s record is impeccable with 34 victories across his boxing career and the sole defeat coming at the hands of a peak Wladimir Klitschko back in 2013. 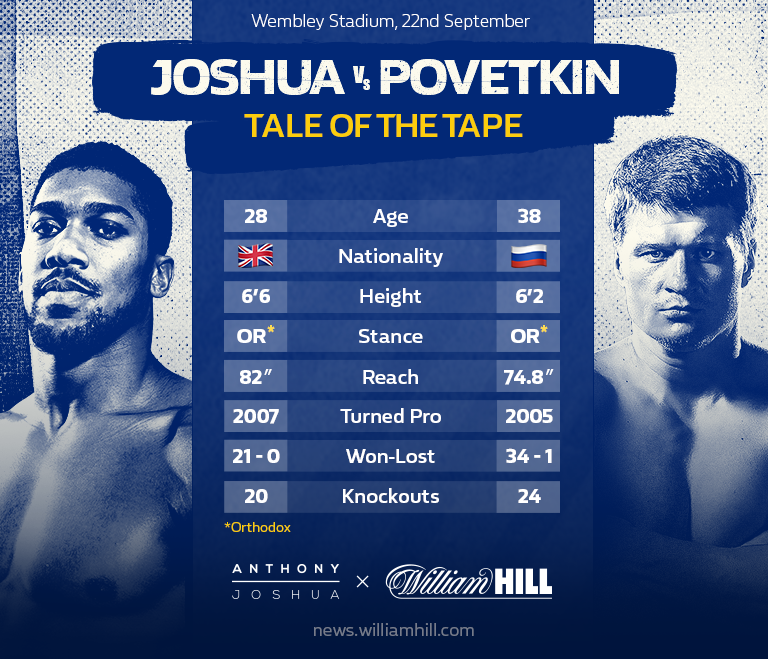 British golden boy Joshua of course defeated the Ukranian boxing legend last year in a memorable bout and the traders believe Povetkin will meet a similar fate when the two Olympic champions meet on Saturday in Wembley. The numbers behind this heavyweight bout tip the game as a heavyweight clash. With 20 of his 21 professional career wins having come in the form of a knock-out – and the very suggestive 4/11 odds of that happening again against Povetkin – you might be wondering whether there was value in any other market for this heavyweight bout. But Alexander Povetkin is a formidable opponent and our betting prediction is Anthony Joshua to win by a decision – majority, unanimous or technical – with those odds forecast at a 3/1 tip. When Klitschko defeated the Russian in 2013, he won on a decision, failing to secure his win of a knock-out decision – despite Povetkin dropping in the second round and further three times in seventh round of the bout. Worse still, referee Luis Pabon allowed Klitschko to lean aggressively on his short counter-part throughout the night. Povetkin is a seriously powerful and husky fighter with a pressure fighting style that has proved effective against taller oppenents throughout his career. The White Lion surviving the entirety of the 12 rounds against Dr Steelhammer proves that Joshua winning by a knock-out won’t be as likely as the betting odds might suggest. At 6”6, the Watford warrior will tower over the 6”2 Russian meaning Povetkin will attempt to play the Brit at mid-range where he can get his best shots off. Joshua recently lost his 100% knock-out ratio when Joseph Parker took the unified heavyweight champion to 12 rounds. Our betting prediction is the fight to go the distance with those odds priced up at 11/4 pick. The rest of the odds have Anthony Joshua to win by an unanmious at 7/2, a majority decision at an unfancied 33/1 whilst a draw is also betting at 33/1. There is an enhanced odds market offering a Joshua victory within rounds 6-8 which was trading at 11/5 but now finds itself priced up at 3/1.